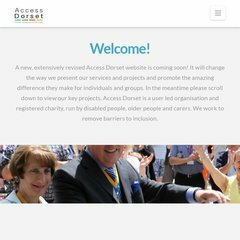 Topics: Accessibility, Dorset Centres For Independent Living, Lifestyle, and New Opportunities. It is hosted by Xcalibre Communications Ltd (Scotland, Livingston,) using Apache web server. The site is programmed for PHP/5.2.17. There are 2 Nameservers, ns1.xcalibre.co.uk, and ns2.xcalibre.co.uk. PING www. (217.8.240.56) 56(84) bytes of data.